Ammonia synthesis through electroreduction of nitrogen on black phosphorus nanosheets. More than 100 years after the introduction of the Haber–Bosch process, scientists continue to search for alternative ammonia production routes that are less energy demanding. Chinese scientists have now discovered that black phosphorus is an excellent catalyst for the electroreduction of nitrogen to ammonia. According to their study published in the journal Angewandte Chemie, layered black phosphorus nanosheets are a highly selective and efficient catalyst in this process. Ammonia is an essential raw material in all industrial areas, from agriculture to fine chemicals and the pharmaceutical industry. For more than a century, it has been synthesized industrially by the Haber–Bosch process, in which nitrogen from air is reduced with hydrogen or synthesis gas under high pressure and temperature over a transition-metal catalyst. However, the energy demand of this process is so high that one to two percent of the global energy supply is devoted to industrial production of ammonia. Researchers are in search of milder alternatives, which employ catalysts that operate under ambient conditions. Metal-free alternatives are especially desirable. A highly interesting candidate is phosphorus in its lowest reactivity, nontoxic form: black phosphorus. This material is a rising star in electronic applications because of its metallic-like appearance and unusual electronic properties. Moreover, its puckered two-dimensional sheet-like structure may provide the necessary edges and sites for adsorption and molecular activation. With this idea in mind, researcher Haihui Wang at the South China University of Technology, Guangzhou, China, and colleagues, prepared thin layers of bulk black phosphorus, “by a facile liquid exfoliation method,” as stated in their publication. The catalyst nanosheets were included in a carbon fiber electrode for electrolysis. To provide a nitrogen supply, a hydrochloride electrolyte solution was saturated with nitrogen. 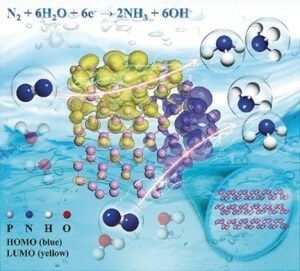 On application of a voltage, the electrode readily and selectively produced ammonia from nitrogen, and the layered black phosphorus even outperformed “most nonmetallic and metal-base catalysts reported at present,” added the authors. The extraordinary activity and selectivity of this material are explained by the structure and energetics of the phosphorus sheets. What is so special about phosphorus? With theoretical calculations, the authors found that the zigzag arrangement in the phosphorus layers, in contrast to other layered or flat materials, provided ideal sites for nitrogen adsorption and the electronic structure at the edges was best suited for binding, activating, and reducing nitrogen by a low-energy pathway. Having explained the extraordinary activity and selectivity of the layered black phosphorus catalyst, the authors admitted that—despite the generally good stability of black phosphorus under ambient conditions—its performance declined in the long term because of oxidation. “Thus, further improvements in preventing black phosphorus degradation in the electrolyte will be beneficial,” they concluded. This work opens up a novel and attractive application for black phosphorus. In electrocatalytic nitrogen reduction, the performance of black phosphorus is superior to other nonmetallic and even metallic catalysts, suggesting that this material may soon play a bigger role in electrocatalysis. In time, perhaps even the Haber–Bosch process will have a competitor.